THE MONSTERS ARE BACK! 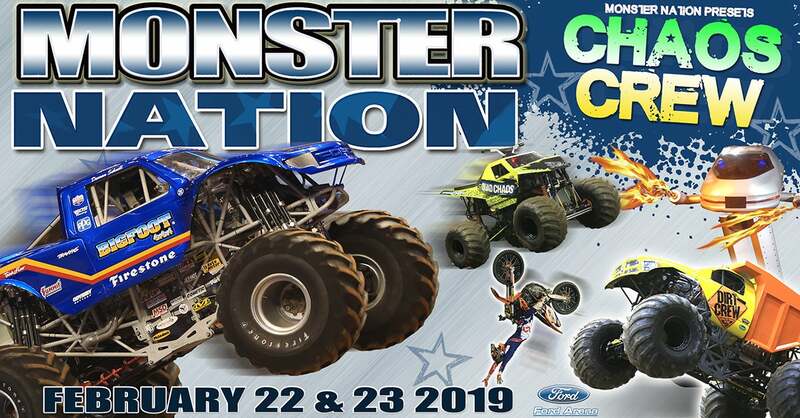 Monster Nation proudly presents the MONSTER NATION CHAOS CREW TOUR coming to Beaumont’s Ford Arena for three big shows on Friday, February 22nd and Saturday, February 23rd! The country’s toughest monster trucks will be competing at the MONSTER NATION CHAOS CREW TOUR! The all-star monster lineup includes DIRT CREW, QUAD CHAOS, TWISTED ADDICTION, DRAGONSLAYER, WICKED, AND THE LEGENDARY BIGFOOT! Monster Trucks will battle in three separate competitions during each performance. The tailgate-ripping Wheelie Contest is first, where each drive attempts to stand his 10′ tall monster straight in the air. The next event is elimination-style Head to Head racing around an oval course. But what will undoubtedly complete the scene is the no-rules, no holds barred Demolition Freestyle competition! And if that’s not enough Monster Chaos, there will be a show-down between interstellar robots REPTAR and GALACTRON! In an exciting display of good vs. evil, these flame throwing, transforming bots will duel to the finish to preserve the peace in Monster Nation! Back by popular demand is the high-flying CHAOS CREW FREESTYLE MOTOCROSS The stars of CHAOAS CREW FMX are out to decide who can pull the big tricks and claim freestyle supremacy! It will be determined forty feet in the air inside Ford Arena. It will take some extreme backflip action to claim the ultimate freestyle trophy! Groups 10+ Save On Monster Nation Seats & Pit Passes! P1 $25.00 $20.00 $5 + A Free Pit Pass! P2 $23.00 $18.00 $5 + A Free Pit Pass! Deadline to place group orders is February 21. Don’t forget to your your Monster Nation Pit Party Pass, where Monster Nation fans can get up close to the Monster Trucks, get autographs, take pictures and meet the stars of Monster Nation! 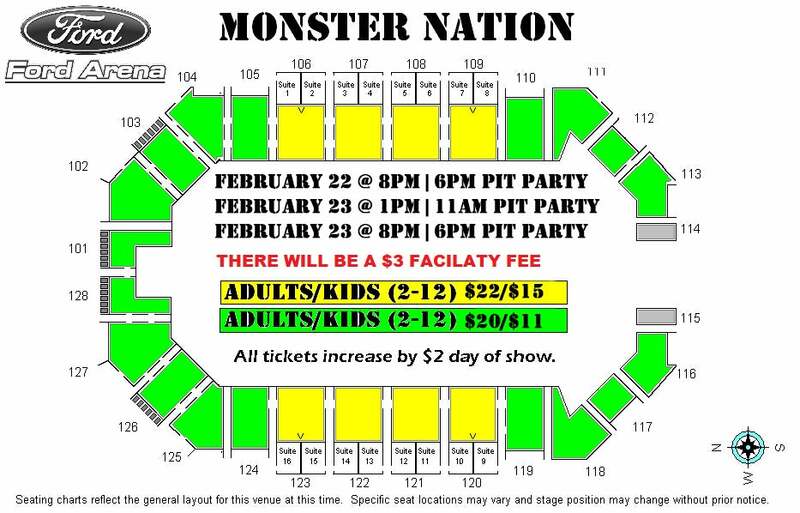 The Monster Nation Pit Party happens from 6:00 – 7:00 pm before the 8 pm shows, and from 11 am- Noon before the Saturday, February 23rd 1 pm matinee. Tickets are on sale and available at the Ford Park Box Office, ticketmaster.com, or charge by phone 800.745.3000. Additional fees may apply.